The Genebank Platform is an essential component of a global system on the conservation and use of plant genetic resources for food and agriculture (PGRFA). Other parts of the global system include national and regional collections and all users of genebanks worldwide. 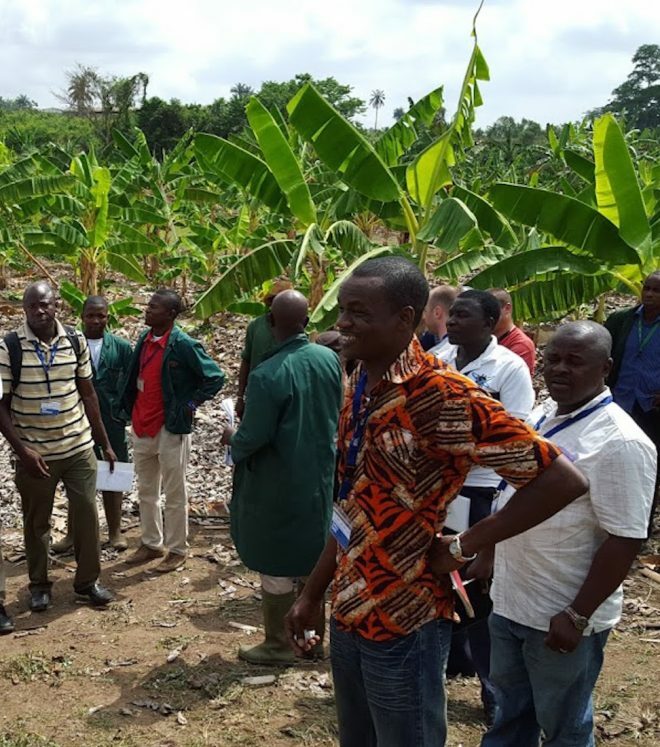 Explaining management of field collection of banana and plantain to participants of the Genebank Operations and Advanced Learning (G.O.A.L) workshop, March 2016 at IITA in Ibadan, Nigeria. The 11 CGIAR genebanks – collaborating within the Genebank Platform – are a core element in the global system for the conservation and use of crop diversity. So too is the International Treaty on Plant Genetic Resources for Food and Agriculture (ITPGRFA), which establishes the conditions under which CGIAR genebanks hold and share material. The Crop Trust is one of the mechanisms through which the Treaty promotes long-term sustainable conservation and use of PGRFA. Crop-specific networks and bilateral and wider agreements among countries and organisations. This includes CGIAR Research Programs and Platforms. The Genebank Platform will have particularly strong links with the Big Data and Excellence in Breeding Platforms. National and international genebanks outside CGIAR also undertake ex situ conservation; some represent globally important resources that complement those of CGIAR genebanks. Farmers’ organisations and breeders – public- and private-sector – are important users of PGRFA. They need easier access in order to make more use of germplasm, while the information produced as a result of that use would be more valuable if it were more widely shared and available.